Last month, it was announced that Sergei Fedorov and Nicklas Lidstrom would be inducted into the Hockey Hall of Fame, in their first year of eligibility, this November. It’s fitting that the two players will go into the hall together since they had a lot in common; both racked up individual honors throughout their careers, both had extensive international experience, and both defied the stereotype of European stars being too flashy by excelling at both ends of the ice. And, of course, they had one more thing in common: They spent more than a decade as teammates with the Detroit Red Wings in the ’90s and early ’00s. And most important of all, now that they’ve been named to the 2015 Hall of Fame class, they’ve finally earned a seat at the big kids’ table for 2002 Red Wings team reunions. More on that in a second. We’ll tend to use this feature to highlight teams that were underappreciated or largely forgotten, and it’s hard to make that argument for the 2001-02 Red Wings. After all (spoiler alert), they ended up winning the Stanley Cup. 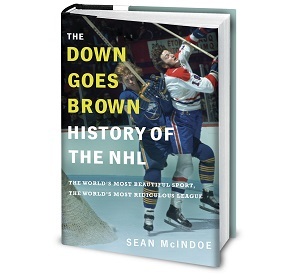 But we’ll make an exception here, because while the ’02 Red Wings were certainly impressive at the time, the lens of history has left them several magnitudes more fun. And it’s becoming apparent that we’ll never see a team quite like them again. The 2000-01 Red Wings had racked up 111 points, tied for the second-best total in the league. That team was pretty stacked in its own right, with Lidstrom and Fedorov joined by established stars like Steve Yzerman, Brendan Shanahan, Chris Chelios, and Igor Larionov. The 2001 Wings went into the playoffs as solid favorites over the Kings, who by this point were well into the eminently forgettable Ziggy Palffy era. But after a pair of convincing Detroit wins to start the series, Los Angeles squeaked out four straight one-goal wins to take the series, finishing things off with Adam Deadmarsh’s Game 6 overtime winner against Chris Osgood. Clearly, a first-round exit for a team with as much talent as the Red Wings was unacceptable. Something had to be done. But what? Holland got started in late June, trading Vyacheslav Kozlov and picks to the Buffalo Sabres for legendary goaltender Dominik Hasek. It was a lopsided trade in the Wings’ favor, driven more by the Sabres’ finances and Hasek’s desire to chase a Cup outside of Buffalo than by actual hockey concerns, and Holland took advantage. The acquisition paved the way for Osgood’s exit, as he was picked first overall by the Islanders in the waiver draft. When all was said and done, the 2002 Red Wings were very, very good. They were also old. Very, very old. The acquisition of Hull gave the Red Wings a stunning 10 players who’d be 35 or older by the end of the season. And we’re not talking about some grizzled veterans playing supporting roles — virtually all of the team’s top players were ancient. Larionov was already in his forties and Chelios would join him during the season. Hull and Hasek were 37, Yzerman was 36, and Robitaille was 35. Guys like Shanahan, Lidstrom, and Fedorov were considered the team’s youthful core, despite all being well into their thirties. And it wasn’t just the big names. The 2001-02 Red Wings roster also contains a nice selection of “I forgot he ever played for them” old guys, including Steve Duchesne, Fredrik Olausson, and Uwe Krupp. You could never build a team like this in today’s NHL; not only would the salary cap make it impossible, but today’s style of play would see all those old guys get eaten alive. But while the 2001-02 Red Wings were still in the middle of the clutch-and-grab era, the game wasn’t that much different, and plenty of people thought Holland was crazy to assemble this many old codgers on one roster and think he could win with them. What would (the aging all-star portion) of such a team look like today? The Sedins, Thornton, Marleau, Iginla, Jagr, Luongo... Datsyuk, and Zetterberg? That's fully 8 of the active top 20 leaders in assists including the top 3 and the goalie with the second most games played, tied for third career save percentage with Price, Rinne, and Bobrovsky.